If you want to only allow TLS on your site, we have you covered. 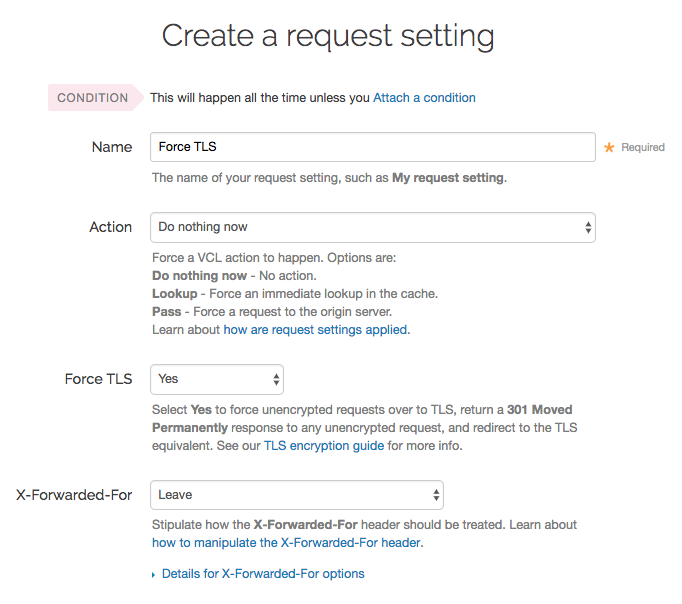 We've built a switch into the request settings that will allow you to force unencrypted requests over to TLS. It works by returning a 301 Moved Permanently response to any unencrypted request, which redirects to the TLS equivalent. For instance, making a request for http://www.example.com/foo.jpeg would redirect to https://www.example.com/foo.jpeg. WARNING: Requests can still happen over HTTP first even if you force a TLS redirect using these instructions. To keep this from happening, enable HTTP Strict Transport Security (HSTS). These instructions assume that you've set up TLS service with Fastly. In the Name field, type a human-readable name for the request setting. This name is displayed in the Fastly web interface. From the Force TLS menu, select Yes. Click the Create button to save your request setting changes.